Browsing articles tagged with "Space Island"
IMPORTANT! – This event is not at Space Island. Please do not go to Space Island’s residence. Come celebrate the 5th Annual downtown event AfterParty. A journey away from the island. Keep the endless dream alive. There will be NO shuttles running from the L.A. 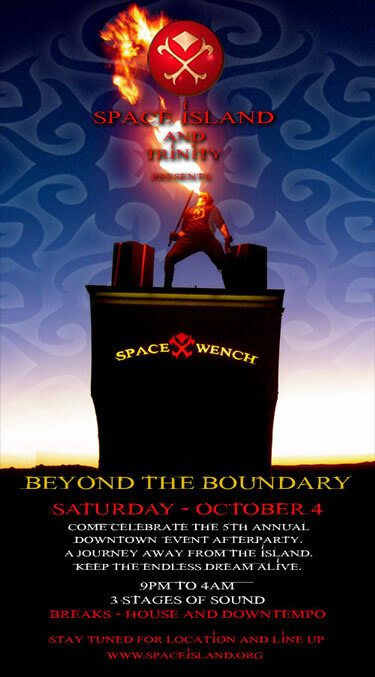 Burning Man Decompression event to the Afterhours. There will be plenty of street parking at the afterhours. Please know we expect to reach capacity early as we have in the past 5 years. Food will be available with plenty of vegetarian choices. This is a permitted event and will sell out. If you don’t pre-sale tickets get there early! Come play in your favorite jammies, bunny slippers or lingerie! Space Wench Fundraising Lingerie Sample Sale! Entry by shuttle only, no driveups allowed!